The next-gen games console war could be set for another twist this week. Today sees the release of the much mooted Halo 3 game for the Xbox 360. It's expected to be the biggest game of the year, and to spark massively renewed interest in the console itself. Around 10,000 games stores in the US opened at midnight last night to sell copies of Halo 3. And analysts expect that enough will be sold to rake in $150m in the first 24 hours alone - that's far more than any Hollywood movie in history. Stores will be opening at midnight tonight in the UK. 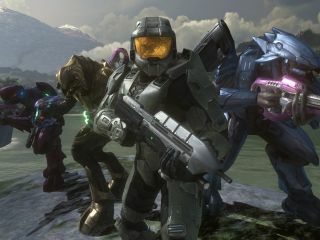 The Halo games franchise is one of the biggest in the world. Ever since the original game launched on the first Xbox console, gamers have drooled over the prospect of playing sequels on the high-definition Xbox 360. Halo 3 is the second such sequel, and could be about to become the biggest selling game in history. Over the last year, it's been the Nintendo Wii console that's received all the press. The Wii has been fun, exciting and, more importantly, it's been different. But what the Wii can't do is pump out gorgeous high-definition graphics and beautiful feature-rich atmospheric cinemascapes. Games like Halo 3 are far beyond its reach. And that's good news for Microsoft and its Xbox 360 console. This is the Xbox 360's time to shine. Many reviewers are saying that Halo 3 is good enough to warrant buying an Xbox 360 console especially to play it. While that may or may not be true, it could certainly be the tipping point for people who've been unsure which console to plump for. The game makes the Xbox 360 an even more attractive prospect. The Xbox 360 has taken a backseat in recent months. Sales of the Wii have eclipsed it. But in terms of total sales, it's still the biggest selling next-gen console in Europe and the US. And with Halo 3 being released in Europe today, a big Xbox 360 sales boost could send the Microsoft console skyward once again.